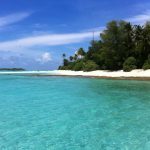 Peleliu Island in the country of Palau is a part of the beautiful “rock islands” – hundreds of small limestone islands all covered with vegetation. 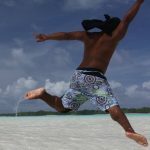 This southern most part of Palau offers spectacular beauty in the form of pure white sand beaches, peculiar looking umbrella-like shaped islands, intense green vegetation covering the islands and its turquoise waters. There are a number of reefs in the area and snorkeling provides excellent visibility and a diversity of marine life. 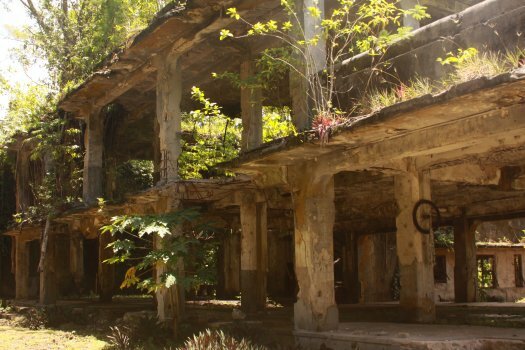 To look at Peleliu and its surroundings today – you would never guess that this island has felt so much pain; some of the fiercest battles in WWII took place here in 1944 between Japanese and American forces. The island was thought to be critical in America’s final war plans as it contained a large air strip and to posses that strip and the island was considered a strategic location in controlling the Philippines. Hindsight showed that this island ultimately was not as strategic as originally thought. The US military estimated it would take only 2-3 days to take over the island – this short battle soon escalated into two months in which thousands of lives were lost on both sides. 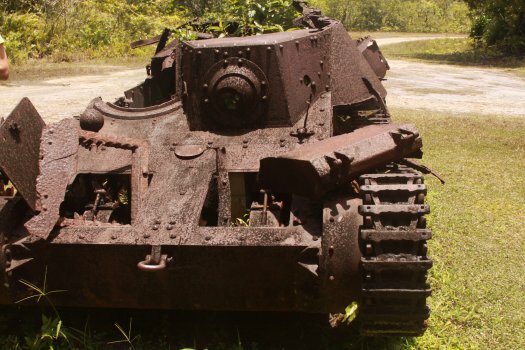 A visit to the Peleliu WWII Memorial Museum is a moving experience. 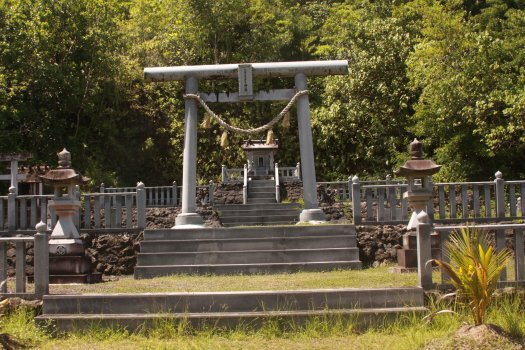 It examines in detail through photos, articles, and relics – how war affected the island from the perspective of both the Japanese and American soldiers. In addition the museum provides exhibits on the island’s recovery once the war was over. Thousand Man Cave is well worth visiting – this limestone was hand dug by Chinese and Koreans during the war and features a maze of tunnels and chambers. 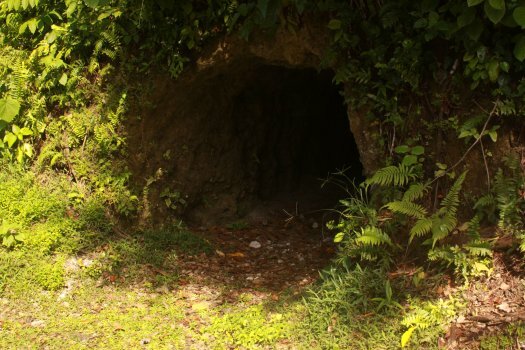 A visit here requires a flashlight and an expectation that you might be dived upon by bats, come across large spiders, have to bend over for most of the way as these caves are short and walk on a very uneven surface. Surprisingly, a number of war relics still litter the floor of the caves – including original sake bottles, shoes, canteens, helmets and other war items. A number of Japanese lived here undetected for 2.5 years after the war ended. Finally they had to be convinced the war was over and they came out of hiding. One of these men, Mr. Kiyokazu Tsuchida has visited Peleliu a number of times – even recently, despite being in his 90’s. Interestingly enough, some people still have jobs directly attributed to World War II, some almost 70 years after the war ended. Discovery and removal of ammunition, bombs and other weaponry still continues on the island – based on grants given by individual countries. Two landing sites featured heavily in the attack on the island in 1944 – the appropriately named White Sand Beach and Orange Sand Beach. Today both bucolic beaches are devoid of people – overlook beautiful waters and in no way resemble the devastation that place nearly 70 years ago. From here amphibious tanks came ashore and fire bombed much of the island; when looking at pictures from that era all you see are charred sticks – everywhere. Two long strips of concrete form the “cross” of the airstrip and was one of the reasons this island was considered so valuable. Today the airstrip is mostly covered with grass but you can still drive on it. The headquarters of the Japanese military generals stands nearby – this building suffered a direct bomb blast from a navy ship anchored off shore and you can still see the gaping crater in the ceiling. The building, like everything else from this era is slowly succumbing to the salty and humid environment and part of the building is starting to collapse. This and a number of other relics on the island are just rotting away and without restoration, in 100 years may not have much “form” left. 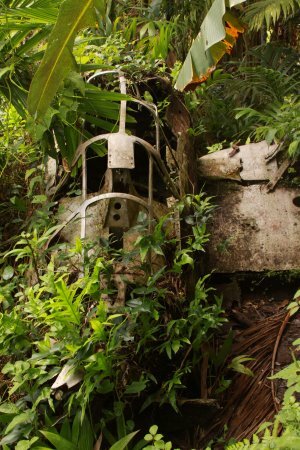 Other highlights include a 300 mm giant gun hidden in one of the limestone caves (never used), a number of tanks, a downed “zero” Japanese fighter plane and both Japanese and American memorials next to each other on what is known as “bloody nose ridge” – scene to some of the most horrific fighting on the island. 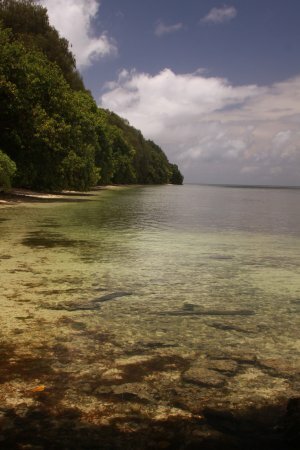 My brother lost his young life on this island (Palau) in 9/1944. I still have sad moments thinking about it. Many odd situations in my life have taken place since that time and even now surface. G – the direct connections to those men who are still among us who so bravely fought in the Pacific during the early 1940’s is becoming dimmer and dimmer with each passing day. 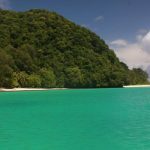 I’m sorry to hear about your brother all these years later – did you ever visit Palau?